I asked Ed, "Ed, how did you get this far in your career?" and he said "You know? Years and years back, I decided that every day I would take one to two hours for myself and study something new". And that's what I've been doing for the past ten years: every morning I get up at five, knowing I've got the house to myself for at least two hours. the first two days I spent them catching up with email or reading infosec news. But then I thought, there's gotta be a better way to spend this time. So I set myself study goals. It's only missing one thing: direction. Before 2010 I had some less-than-fun experiences with studying. My previous employer had a very rigid process for certification, requiring you to pass through a certain strict of (what I considered to be very drab) certifications before allowing you to move on to the fun stuff. So I'd turned into someone who didn't enjoy studying: it was a "must" instead of a "want". Now, studying for my CISSP around that time changed things a bit! I spent weeks upon weeks working through that fat book, doing exercises and research, taking a bootcamp to earn that valued cert. And it was great! But then I turned into a CISSP slacker. But things got better! Because in 2013 I had enough of it! I'm not a fscking slacker, I'm a professional! Sure, everybody has got their hangups, as do I. So I tackled them! I turned to my best friend and brother-from-another-mother Menno and asked him for choaching. The life-coaching kind of style. I'm very grateful for the help he offered me at the time. One of the things to come from those coaching sessions is direction. There we go! The missing ingredient! And the funny things is that what's needed, is already in the title of this post: a plan. At the time I made a plan that would allow me the bare minimum to retain my CISSP status. That was the first hurdle to take, allowing me more freedom to move and breathe once it'd been taken. Well it worked! And instead of settling back into the slacking I'd done before I started setting myself goals and challenges in the form of certifications. It's not that I believe certifications to be the silver bullet to a great career, but setting them as a goal tends to provide focus: you have to study hard enough, with a certain deadline, to make the cut. Initially I consulted friends and collagues to find which certs would provide value to my resumé, which led to the RHCSA and RHCE certs. And from there on, things just kept rolling and expanding! 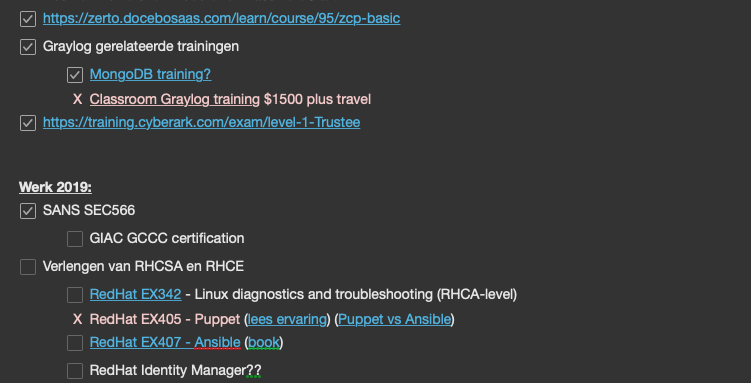 Classes left and right, webinars and videos from infosec conventions and more and more certifications. If at any point in time you run into something and think: "Gee, it'd be cool to mess around with that a bit!" make a note. Send a quick email to yourself, so you can put it on your big list of things to study. Now, a Big List of Things to Study (BLTS(tm)) isn't just enough; that's a dogpile. You need focus. Decide which thing(s) you're going to study in the next 3 months, 6 months and year. Personally I group items by year, putting everything else on the "would love to" stack. You can grab anything from this list as filler, when the other goals have been met. Allow yourself some slack inbetween large goals. Back in 2014 I spent two months learning and loving League of Legends. René always said I can't do anything without taking it seriously, so I studied LoL hard! Played every night, watched the competitions, read lots of guides, etc. But it was a lot of fun and it paid off insofar that I was ready for the next study-goal afterwards. No more zero days. Every day, do something! Something that brings you closer to your goal. You don't have to study all night every day! Just stick with it, chipping away at the goal.